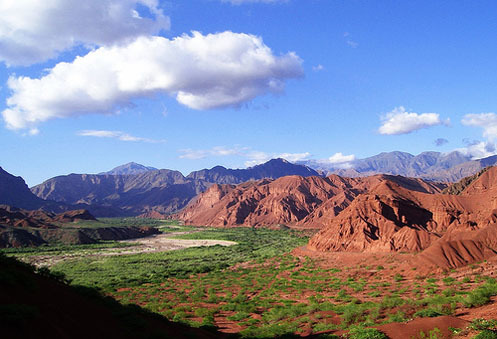 Salta, in the Argentinian pampas, feels miles from anywhere. Then when you head out of Salta, as we did, rising through the foothills of the Andes you can drive for hours without seeing anyone except a few gauchos on horseback in the distance, maybe a condor soaring overhead. Rock and cacti and dust and heat. It was a far cry from the cosmopolitan hustle and bustle of Buenos Aires where we were heading back in a couple of days for the last two weeks of the project we were doing there. I lay on my back on the hot rock and contemplated the enormous sky, shimmering and rippling in the searing heat. It is a privilege to travel anywhere. Having the chance to go to places as empty of tourists – or even locals – as this one was quite staggering. I held the sides of the rock as my world view stretched to include the scale of the place. Two weeks later I was rushing along one of the long corridors to the presentation room. We had a lot to say. We had squeezed the story from the data. I knew my stuff. The boss here was a small dense centre of dangerous energy. The project room had crackled with fear the couple of times he had popped in to see how things were going during the last few months. Papers fell nervously to the floor and everybody talked at once. Or nobody did. It had taken several weeks for him to accept the idea that he could ask me anything directly rather than always having to go via one f the make members of the team. But thanks to their stalwart refusal to answer on my behalf, their repeated referral of the question to me, he had in the end got used to the idea that i knew what I was talking about despite my gender. But today we owned the show. We had our slide pack and we were ready to go. The locals I had worked with so closely over the last few weeks – challenged, pushed, argued with, confused, infuriated – rushed alongside. They were more nervous than me, even though they weren’t speaking. There was more at stake for them. Afterwards we gathered back in the project room. Dizzy from focusing intently during the 3 hour meeting. Exhilarated it was over. Picking through the details for shortcomings. Alberto took me to one side. “We thought you didn’t care,” he announced solemnly. “You seemed so calm. You never hesitated. It was like we didn’t matter to you.” I began to protest awkwardly and he held up a hand to silence me. “But then I saw your neck was all red,” he carried on in the same serious tone. “And I knew there was emotion there too. I knew then that you do care and I felt we were in safe hands.” I blinked in astonishment. All my life I had hated the way my neck goes red when I am nervous or excited. It had always felt like a weakness. And yet here was this gruff, macho middle aged businessman showing me a new way of looking at this physical sign of inner emotion. I grinned, not just for his words, or his sentiments but for the repositioning that was a gift to me for the rest of my life. I now wear my red neck with pride.